What is the Purpose of the Rosary in Catholic Life? 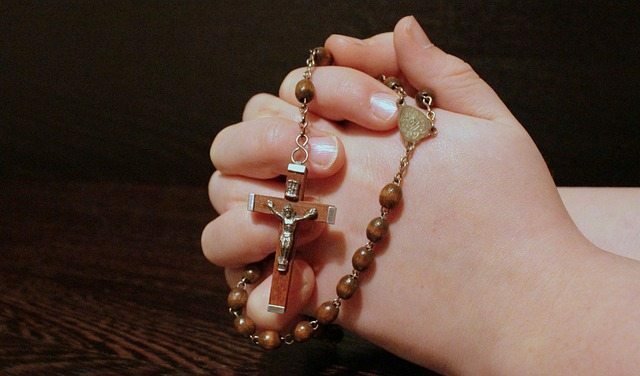 Home » Catholic Questions » What is the Purpose of the Rosary in Catholic Life? October is the month devoted to the Holy Rosary. This is the perfect time for us to reflect upon the meaning of the Rosary and its significance in our walk of faith. The Rosary is taken from the Latin word “rosarium” which means “crown of roses” or “garland of roses.” To us members of the Catholic Faith, the Rosary is a form of prayer that we use along with its namesake prayer beads. When referring to the prayer, the word Rosary is usually capitalized and when talking about the beads, the lower-case form is used. 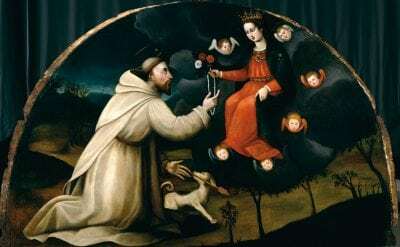 According to pious tradition, the idea of the Rosary was given to Saint Dominic when the Virgin Mary appeared to him in an apparition in the year 1214. This Marian apparition is given the title of Our Lady of the Rosary. The Dominican priest and theologian Alanus de Rupe promoted the practice of the Rosary by establishing the “fifteen rosary promises” and founding several rosary confraternities. The Rosary is a devotion in honor of the Virgin Mary. It is made up of a set number of prayers. At the start of the Rosary are the introductory prayers which are composed of one Apostle’s Creed, one Our Father, three Hail Mary’s and one Glory Be. In the 16th century, Pope Pius V established the standard fifteen Mysteries of the Rosaries which are grouped into three, the Joyful Mysteries, the Sorrowful Mysteries and the Glorious Mysteries. In 2002, Pope John Paul II added a set of five to the existing fifteen mysteries and these became known as the Luminous Mysteries. Today, the total number of mysteries is twenty. The Joyful Mysteries include the Annunciation (Luke 1:26-38), the Visitation (Luke 1:40-56), the Nativity (Luke 2:6-20), the Presentation of Jesus in the Temple (Luke 2:21-39), and the Finding of the child Jesus in the Temple (Luke 2:41-51). Then comes the Sorrowful Mysteries include the Agony in the Garden (Matthew 26:36-46), the Scourging (Matt. 27:26), the Crowning with Thorns (Matt. 27:29), the Carrying of the Cross (John 19:17), and the Crucifixion (Luke 23:33-46). The third mystery is Glorious Mysteries which are the Resurrection (Luke 24:1-12), the Ascension (Luke 24:50-51), the Descent of the Holy Spirit (Acts 2:1-4), the Assumption of Mary into heaven (Rev. 12), and her Coronation (Rev. 12:1). The Luminous Mysteries include the Baptism of Jesus in the Jordan, the Wedding at Cana, Jesus’ Proclamation of the Kingdom of God, the Transfiguration and the Institution of the Eucharist. All throughout the history of the Catholic Church, many popes and saints have encouraged praying the Rosary. As we begin to understand and appreciate the Rosary and pray it more frequently, we come to see the true meaning of its meditations. We begin to appreciate how its prayers are reminders not only of Mary the Mother of God but of Christ himself. Through Mary, we are led to a closer relationship with her son, Jesus. The Rosary is an invitation for us to present our needs to God and to love Him more. When we recite the twelve prayers that form the decade of the rosary, we need to deeply reflect on the mystery associated with that decade. Simple recitation, whether vocally or in silence, is not enough because we miss the true essence of the prayers. Praying the Rosary therefore is not just simply about reciting prayers. It involves reflecting on the grace of God. Praying is a powerful act that lets us develop and strengthen our relationship with God and the Rosary offers the same beautiful reward. By praying the Rosary, we meditate on the events in the life of Jesus Christ and this lets us know God more. When we are unaware of the meditation aspect of the Rosary, we reduce the prayer to an empty, repetitive and meaningless gesture. In Matthew 6:7, Jesus Christ forbids us to practice prayer in meaningless and repetitive babbles. It is precisely the reflective nature of the Rosary that distinguishes it as a powerful and profound way of praying. Rosaries are not just beads or a prayer that we recite during the month of October. Many spiritual battles have been won because of this symbolic act. Many hearts have been touched and many discouraged people have been uplifted because of the Rosary. How do you plan to celebrate the month of Rosary? What is the significance of the Rosary in your personal life? How did it strengthen you in your walk of faith? Stephen Connelly thanks for this wonderful writing on Holy Rosary. There is a great need in educating ourselves and our children the need for praying Holy Rosary, this work of yours helps in this regard. Our Lady of Holy Rosary continue to bless you and your family.